CB-400/CB-400S Getting Started - NexSens Technology Inc.
Before deploying a CB-400 data buoy , it is very important for the user to become familiar with the hardware connections and operation of the system with iChart software. To begin, lay out the buoy, sensors, data logger, and other components that make up the CB-400 system. Follow the steps below to test and assemble the system. 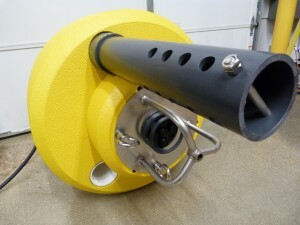 CB-400 data buoys are designed to accommodate the SDL500 Submersible Data Logger for connection of monitoring instruments. On CB-400 systems without solar charging, the SDL500 is powered with D-cell alkaline batteries. A communications antenna may be installed in the SDL500 top bulkhead port for radio, cellular or satellite telemetry systems. Sensor connections are made on the top port and/or the five ports on the bottom bulkhead. 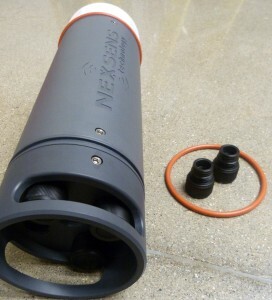 All sensors and devices must have a NexSens UW connector factory installed in order to connect to the SDL500. CB-400S systems include an RBP500 Rechargeable Battery Pack and a solar charging kit comprised of three 10-watt solar panels and a power harness with solar regulator. Figure 3-2 is a schematic drawing showing how these components are connected together along with the SDL500. 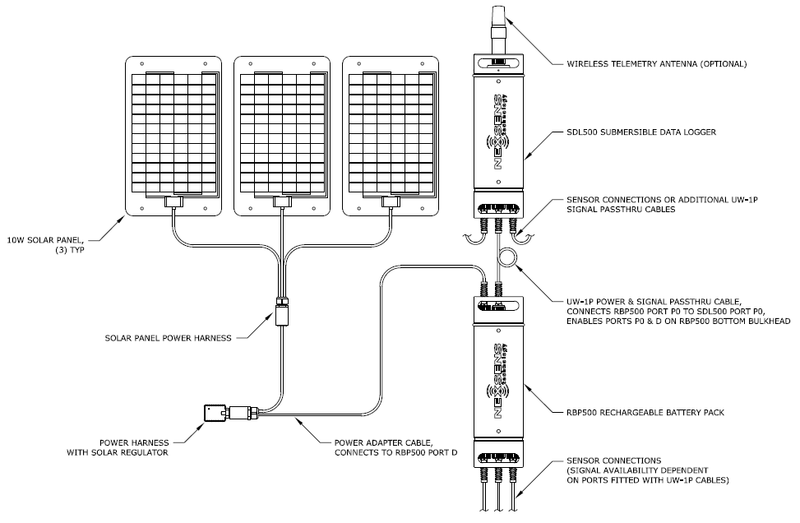 The three 10-Watt solar panels are harnessed together and connected to a solar regulator. This assembly is connected to Port D on the RBP500. Pass-through signals are enabled on the bottom bulkhead of the RBP500 by connecting UW-1P cables from the SDL500 to the RBP500 top bulkhead as shown. The CB-400S package includes (1) UW-1P cable that connects from Port P0 on the SDL500 to Port P0 on the RBP500 top bulkhead. This enables sensors to be connected to Port P0 and Port D on the RBP500 bottom bulkhead. Additional ports can be enabled on the RBP500 by connecting additional UW-1P cables. For example, to enable Port P1 on the RBP500, a UW-1P cable must connect the SDL500 Port P1 to the RBP500 top bulkhead Port P1. 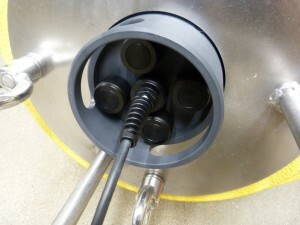 To enable Port T on the RBP500, a UW-1P cable must connect the SDL500 Port T to the RBP500 top bulkhead Port T.
Port A, the Analog sensor port, is not available on the RBP500 because it is used as a vent for the battery. Sensors with analog outputs can only be connected to Port A on the SDL500. 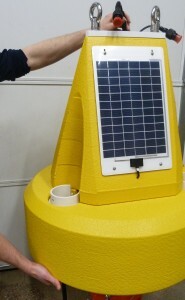 The basic setup for a CB-400 buoy system requires installing sensor cables, connecting sensors and the RBP500 to the SDL500 data logger, installing the SDL500 in the buoy tower, securing the buoy lid, and installing protective pipe caps. The following steps walk the user through this process. After feeding sensor cables into the center chamber, reach down into the buoy tower. Grab the cables and pull them through the buoy tower opening (top). On a CB-400S package, the chamber will also have a UW-1P cable coming from the top of the RBP500. For SDL500 versions with wireless telemetry (radio, cellular or satellite), an antenna must be connected to the top port. No antenna is needed for the direct-connect SDL500. Instead, the port is plugged or used to connect a topside sensor. Important: Double check that there is an O-ring installed on both the antenna plug and at the bottom of the port. The double O-ring seal ensures that connections do not leak. Install the antenna carefully to avoid damaging the pins. Consult the SDL500 manual for additional information on antenna installation. Unscrew the plugs from ports that will be used on the bottom of the SDL500. Store them with the SDL500 maintenance kit for future use. For CB-400S systems, Port P0 will always be used to connect to the RBP500 with the UW-1P cable. Remove the large orange O-ring at the bottom of the SDL500. Keep with the SDL500 maintenance kit. Connect the UW-1P cable running from Port P0 on the RBP500 to Port P0 on the SDL500. Connect additional sensor cables to the appropriate ports. Refer to the SDL500 manual for additional information on sensor-specific port selections. Again, double check for the O-rings on all UW plugs and ports. Carefully slide the SDL500 into the center chamber of the buoy tower. Extra cable slack may need to be drawn through the sensor deployment pipes as the SDL500 is lowered. 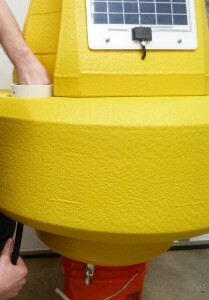 Install the buoy lid to the tower cap using the (3) 3/8”-16 bolts provided with the system. 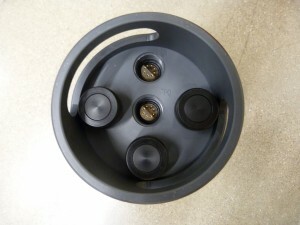 Include a washer and a lock washer between the bolt head and the lid (the washer sits under the lock washer). Tighten the bolts until the lock washers are flattened, then an additional 1/8” turn. Do not over-tighten the bolts to avoid stripping of the threading on the lid and cap. 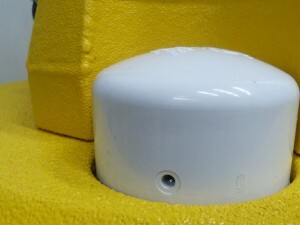 Optional beacons or weather sensors to be mounted on the buoy lid can be installed once the lid is securely in place. 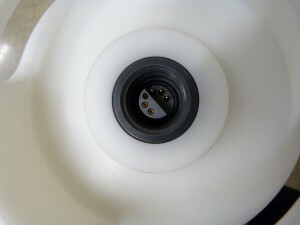 PVC caps are included for additional protection of sensor pass-through tubes. Place a cap over each opening and secure with the provided bolts. 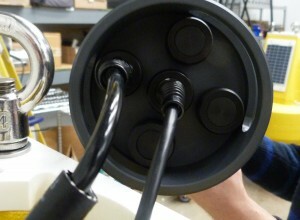 On a CB-400S configuration, sensors may connect into Port 0 and Port D on the bottom of the RBP500 battery pack. The RBP500 acts as a pass-through, so the signal availability on enabled RBP500 ports is the same as is available on the SDL500. For example, the RS-232 and SDI-12 signals on the SDL500 Port P0 are also available on the RBP500 Port P0 when the UW-1P cable is attached. 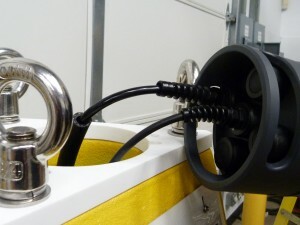 Port P1 and Port T can be made available by connecting additional UW-1P cables between the battery pack and SDL500 within the buoy. Port A is unavailable on the bottom side of the buoy because it serves as a top-side battery vent. 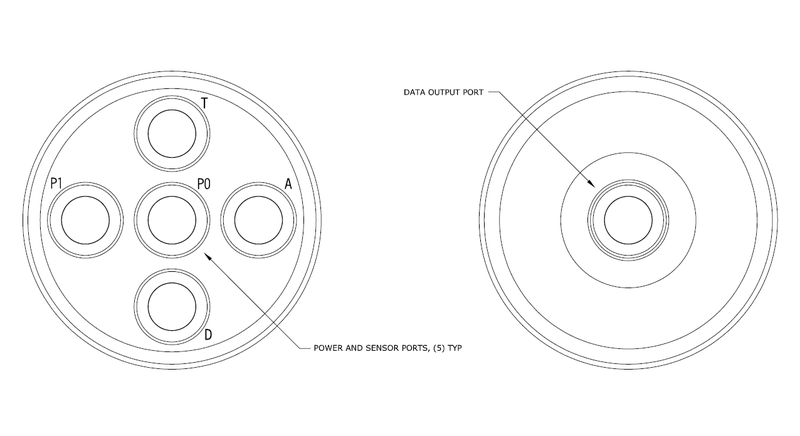 The SDL500 manual contains detailed information on selecting ports for sensor connections. Double check that each UW plug and port have an O-ring installed. Missing O-rings will result in water intrusion and sensor failure. See Section 4.1.2 for more information. 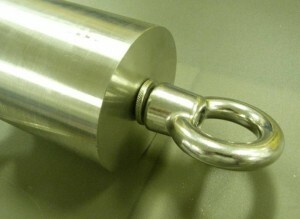 Deployment pipes, instrument cages and ballast weights can be added to CB-400 buoy systems. Deployment pipes and instrument cages provide options for secure mounting of sensors, and ballast weights can help to balance the buoy and prevent overturning. 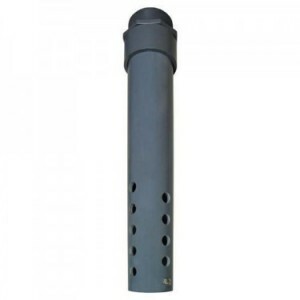 Deployment pipe extensions are easily fitted to the built-in sensor deployment pipes to provide extra protection for sensitive monitoring equipment. The 914 deployment pipe is a 4” Schedule 80 PVC pipe section that attaches to the sensor deployment pipes with a threaded adapter. The bottom of the 914 pipe is fitted with a stop bolt to keep sensors in place. 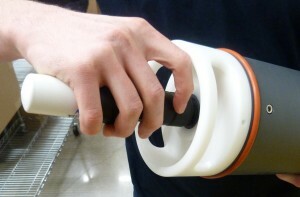 To attach a 914 deployment pipe, lay the buoy on its side and thread the deployment pipe into one of the three available pass-through sensor tubes. Take caution to avoid cross-threading of the adapter. Also make sure the built-in deployment pipes do not rotate inside the buoy hull. 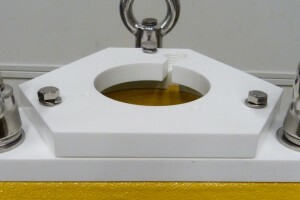 The slotted top end must be properly aligned with the slot in the buoy tower to allow sensor cables to run from the tower to the deployment pipe assembly. 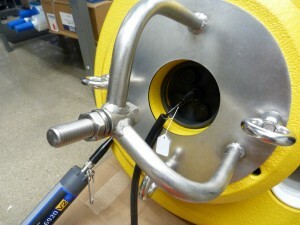 The CB-400 buoy allows an instrument cage to be installed on the bottom. Sensors can be securely attached to the instrument cage. 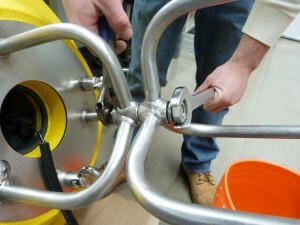 To install the cage, first remove the 1-3/4”-10 x 4” bolt, 1-3/4” lock washer and 1-3/4”-10 nut from the buoy frame. Run the bolt downward through the buoy frame and top of the cage. 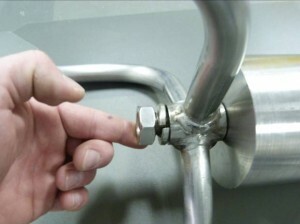 Place the lock washer and nut onto the bolt. Tighten securely with large crescent wrenches, and weld the connection to prevent the cage from coming loose in rough water. Proper ballast weight is essential to prevent buoy overturning. Carefully consider the site-specific ballast requirements prior to deployment. A 25 lb. ballast weight is available for installation to the bottom of the instrument cage for additional balance. Begin installation by inserting the 9-3/4” threaded rod section through the ballast weight and bottom of the buoy frame or instrument cage assembly. 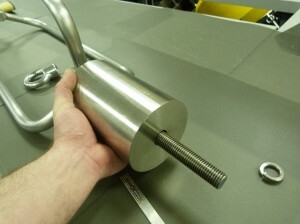 On the bottom end of the rod, tighten a 1-3/4” eye nut with a 1-3/4” lock washer. 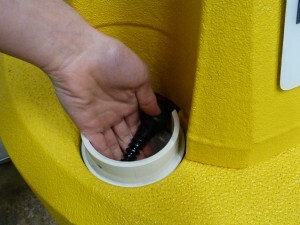 Tighten the top end of the rod securely to the buoy frame or instrument cage with a 1-3/4”-10 nut and 1-3/4” lock washer. 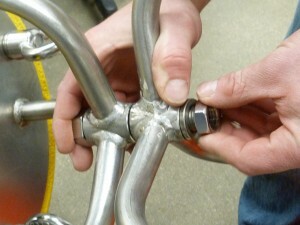 Weld the connections to prevent loosening in rough water.